On Tuesday, November 17th, we left Jojoba Hills SKP Park in Aguanga, CA (outside of Temecula, north of San Diego) and headed out across the Mojave Desert, across the Colorado River and into Arizona for a couple of days of boondocking at the Dome Rock Road BLM camping area west of Quartzsite (free for a maximum of 14 days). In late January, this area will fill up with folks here for the big gem and mineral shows but in November and December it’s pretty empty. 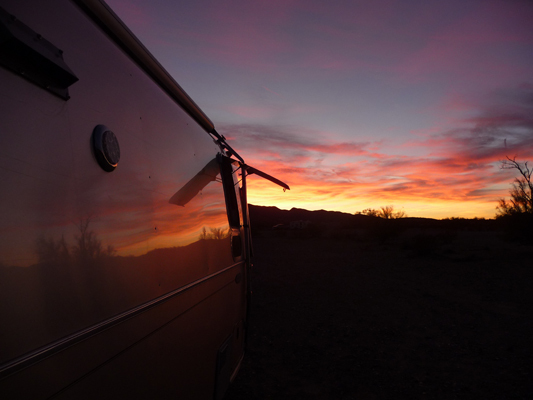 We wandered around a little bit and finally settled on a level site with our dining room windows facing east looking across to the Kofa Mountains. That’s our 2nd nearest neighbor about 100 yards away over there on the right. 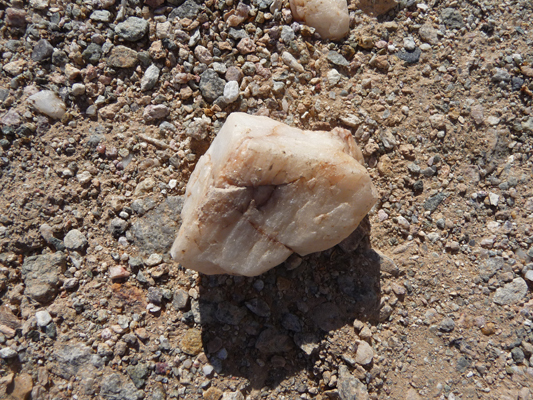 The other places we’ve camped in the Quartzsite area were sand and gravel too but here the ground was covered with pieces of milky quartz of all sizes giving you a hint as to why the place is called Quartzsite! Walter went out looking and found this big junk with lots of little sparkles in it (and a bit of a tush too--and yes it just might remind you of other things too). 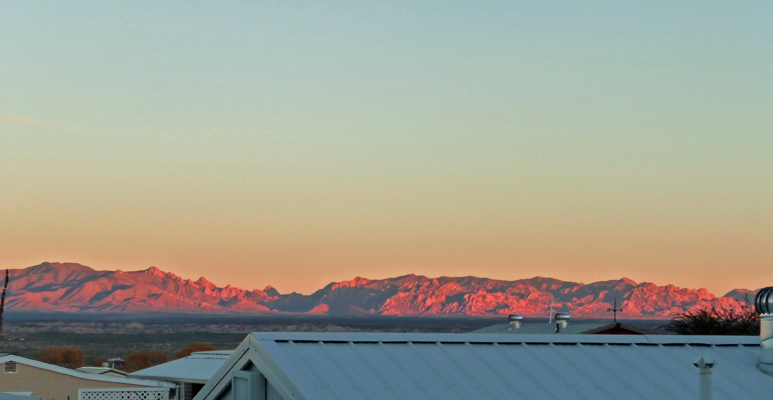 Tuesday evening the Kofa Mountains lit up to the east as the sun went down. I got distracted and when next I looked west there was only a bit of sunset left but it was so pretty I couldn’t resist. 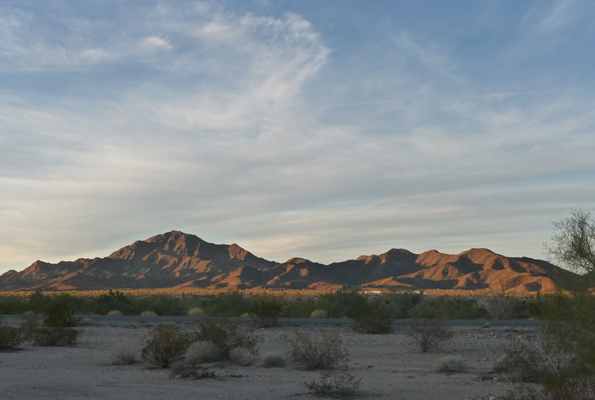 We went out for a little walk-about the next day and I shot this photo of the view looking north. Those little white rectangles at the base of the mountains are semis roaring along on I-10. You can hear the freeway here but it’s not very loud and with the windows closed we couldn’t hear it at all. Looking south from our campsite you can see Dome Rock, the namesake for the road out this way and for the camping area. You can also see our nearest neighbors about 75 yards away. People ride their ATVs out here but there was no one doing it while we were here, thank goodness. 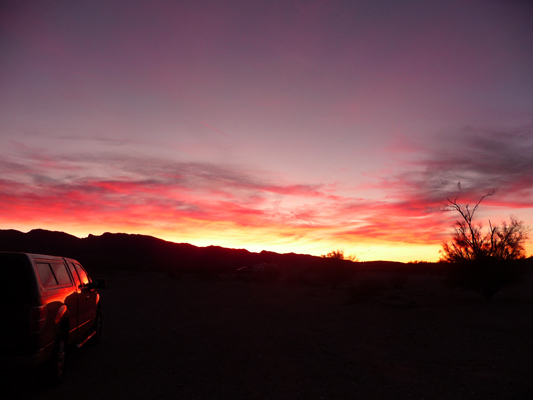 This BLM area is a favorite spot for many people. I wouldn’t put it on the top of my list both because of the nearness of the freeway and the ATV activity but hey, different strokes for different folks. Off in the distance there was a tree that puzzled us. It looked like there was another tree or bush growing in its center. 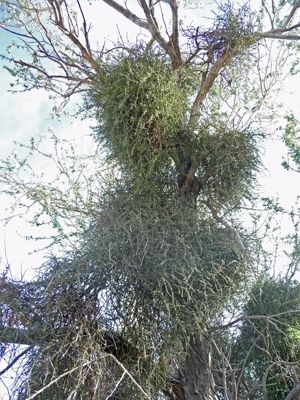 When we got closer we realized that it had a mistletoe-like growth all through it’s inner branches. Very weird stuff! As we hiked up the rise we turned to look back and I shot this photo of Genevieve and the mountains. 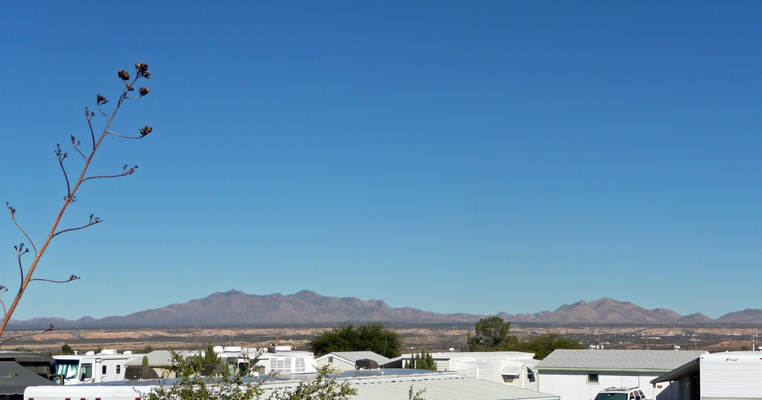 The faint white speckles in the distance on the far right are the town of Quartzsite. I cleaned house that afternoon—I’d been waiting for a down day to scrub floors! And then late in the afternoon the sun began to light up the hills to the north. I love when the light creates these lovely long shadows. 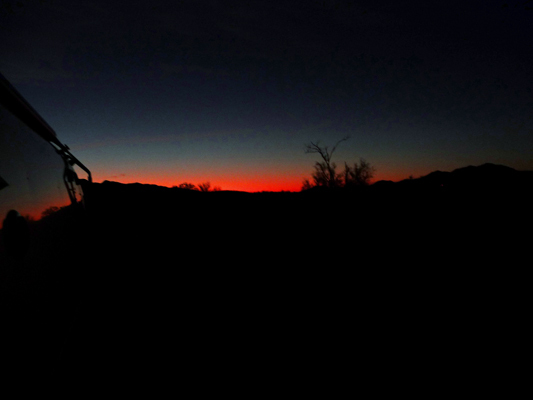 As the sun sank the Kofa Mountains to the east lit up too. 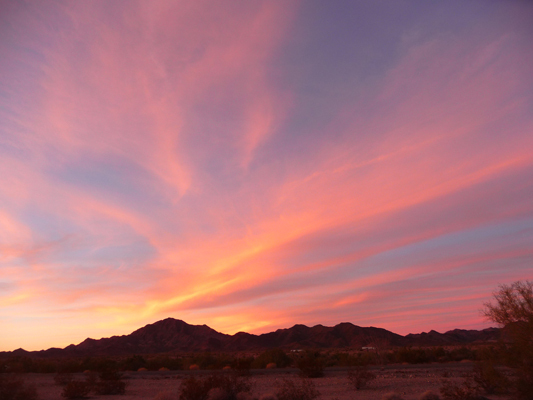 Then sunset began in earnest, first painting the eastern sky pink. And the western sky gold. The pink worked its way to the northern mountains. 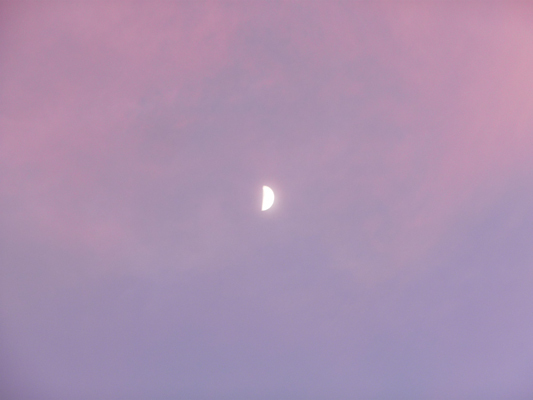 A half moon hung nearly straight overhead. And then the pink, moved to the west. 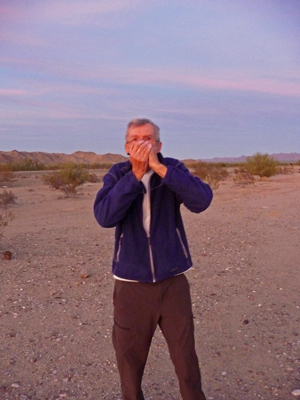 Walter got out his harmonica to serenade us while we watched. I couldn’t resist the sunset reflected in Genevieve’s side. At last it turned red and quickly faded to nothing. 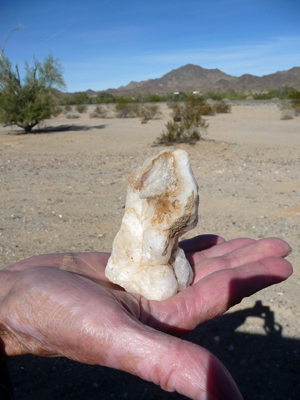 Thursday November 19th, we drove east along I-10 to Goodyear, AZ to stay at the Phoenix Destiny RV Park. We’ve stayed here many times over the years. It’s not a particularly snazzy park but it does have nice citrus trees and it’s near to both our daughter, Leslie, and her husband, Al, and our niece, Amy, and her dad, Mike. Friday, we met Leslie and Al for lunch at PF Chang’s since they’re currently working swing shift on the F-35 Fighters at Luke Air Force Base and were then heading off to Catalina Island in California for a long weekend to celebrate Leslie’s birthday. We did errands on Friday afternoon, and then met Mike and Amy for dinner that night. On Saturday we hung out at Amy’s and she and I did the Thanksgiving grocery shopping—only 4 grocery store stops before we were done! She’s putting on quite a spread on Thursday. 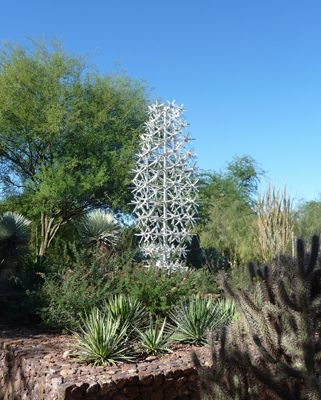 Sunday we drove out to the Desert Botanical Garden in Scottsdale. This is a lovely park that we always enjoy visiting. One year they had a huge Chihuly glass display and they ended up with one wonderful set of pieces that look like yuccas for their entry area. 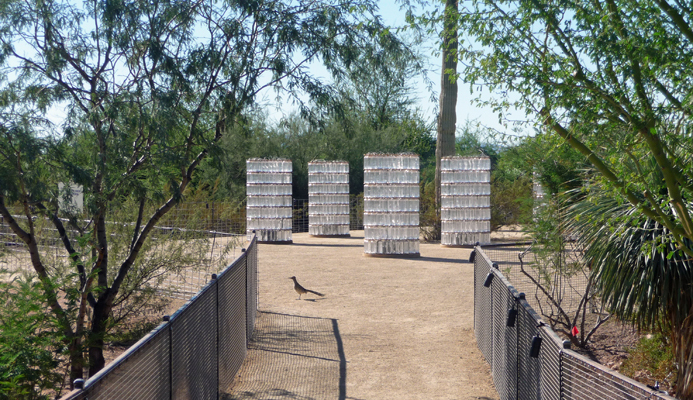 Bruce Monroe’s installation, Sonoran Light, was opening that evening. 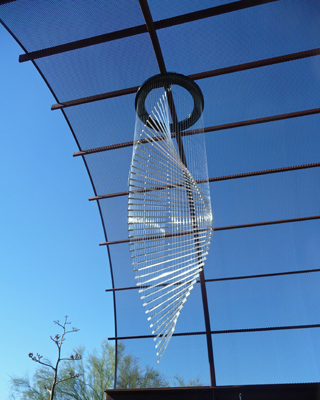 These are art pieces that use fiber optic filaments and other media to create light sculptures. I managed to photograph a lot of them in the sunlight. It’s on display until May 8th, so maybe we’ll get to see it at night if we come back this way in the spring. 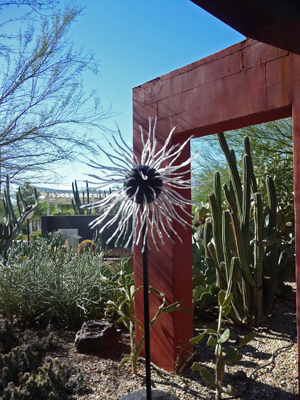 First up is Saguaro. 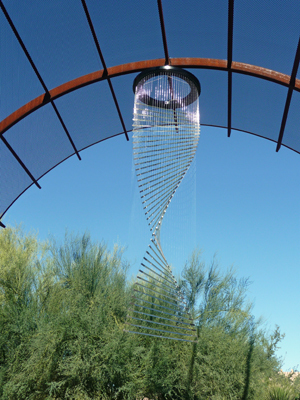 Imagine this light up at night—quite the Christmas Tree! 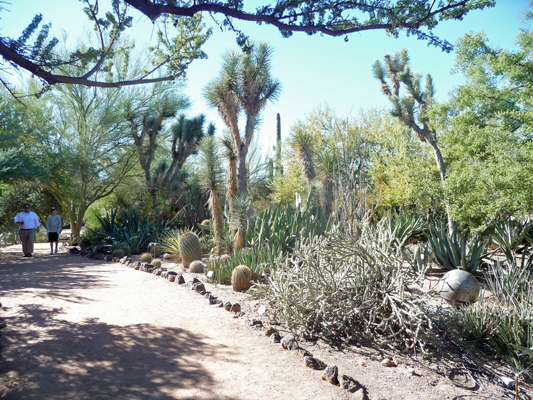 This is a wonderful garden with a great collection of cacti and aloes and other desert plants. 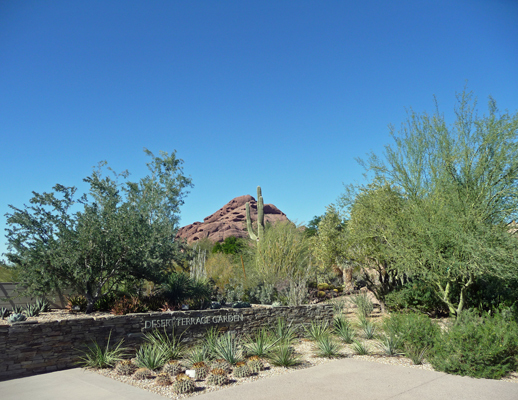 It also has wonderful views of the red rocks around Scottsdale. There were people climbing on those rocks, of course. 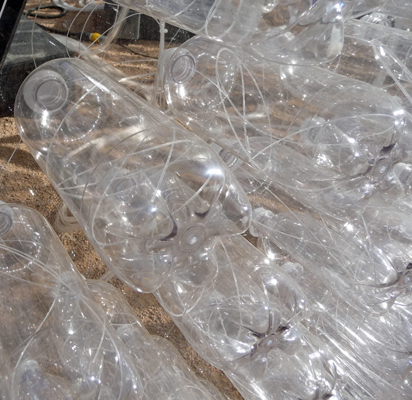 Around the next bend there were huge cylinders made of 2 liter plastic bottles. 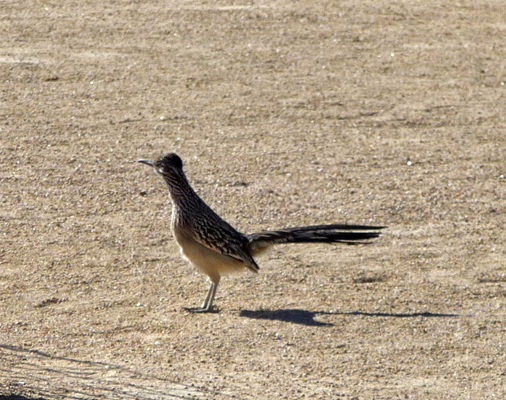 And a road runner—beep beep! 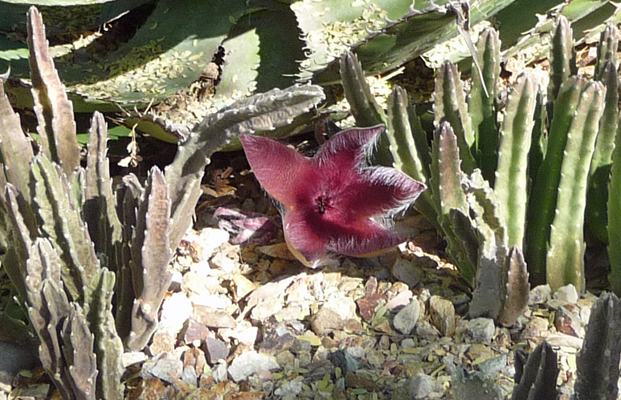 The botanical treat for the day was that the Stapelia gigantea were in bloom. These are ‘carrion’ flowers that smell like rotting meat to attract the flies who are their pollinators. 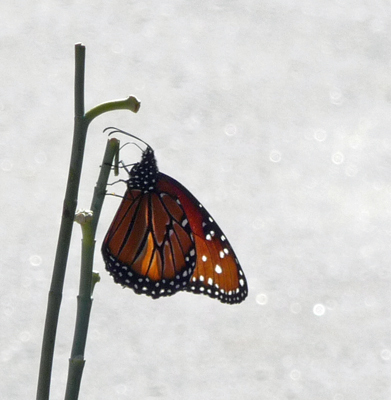 Ah, Mother Nature, you can be so creative! There were only two or three in bloom and they look so lovely. They’re even fuzzy. The sign said they looked like rotting meat, but I don’t agree. 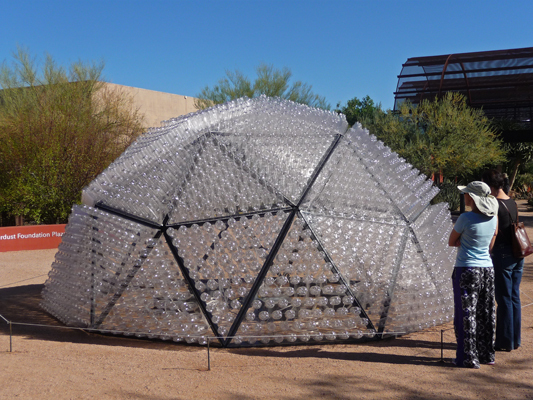 Further along the way we came to a geodesic dome, called Beacon, once again made out of 2 liter bottles. Each bottle had a fiber optic filament threaded into it. All I could think was how long it would take to install this baby! 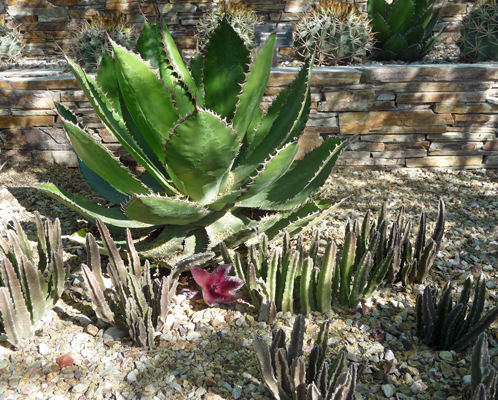 Eden’s Blooms consisted of lovely light flowers in amongst the cacti and aloes. There were bunches a Mammilaria in this cactus display—cactus that grow in little clumps. 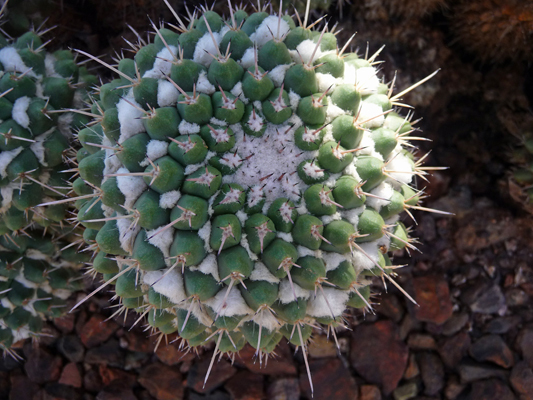 These looked like they had snow in them—they’re Mammilaria compressa. Chindi hung from the arches of one of the cacti houses. The sunlight made rainbows and shimmers in them as they moved in the breeze. 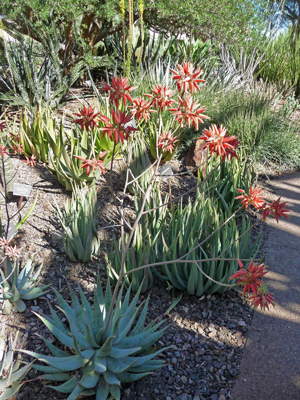 The Aloe hereoensis were in bloom. 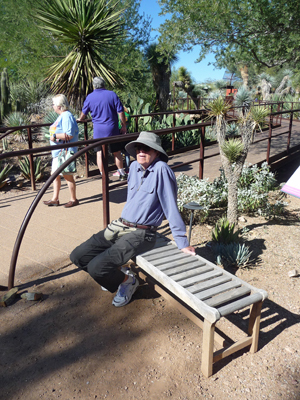 Walter tested out a lot of benches as we made our way along the paths. He does it so well. They have some nice displays of Apache culture along in here including a hogan and a small garden plot complete with native cotton plants. The whole hillside on the south side of the park was covered with fiber optic filament and little balls. I can imagine what it must be like at night. 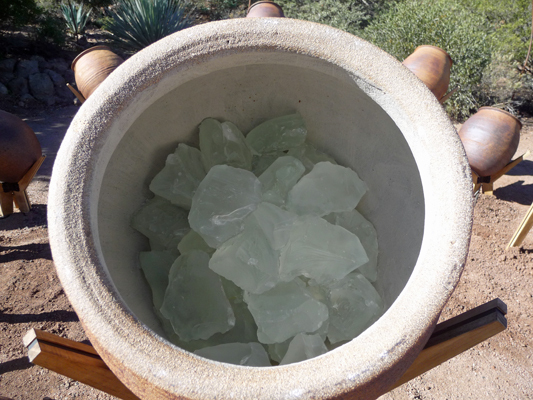 And tucked in amongst the plant displays there was a set of large ceramic jars filled with frosted glass and more light filaments. 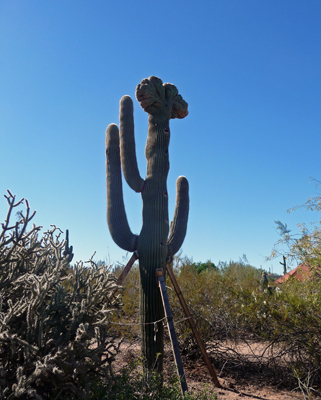 Just around the corner was a big old saguaro cactus with a cresta (caused by a virus if I remember rightly). 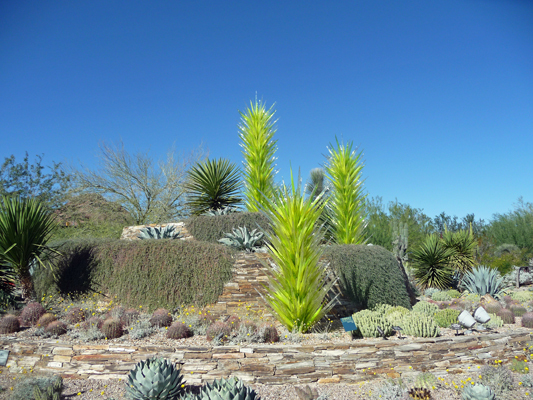 We saw bunches of these at Organ Pipe National Monument in southwest Arizona last winter. Down this lovely walkway there was an installation called Fireflies. It consists of lots of these little fountains of light. 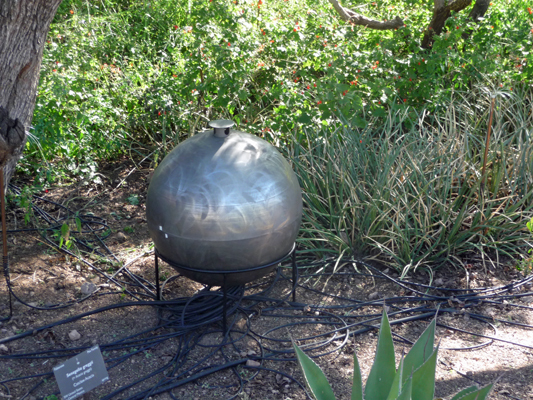 With their wires coming from these lovely metal balls. 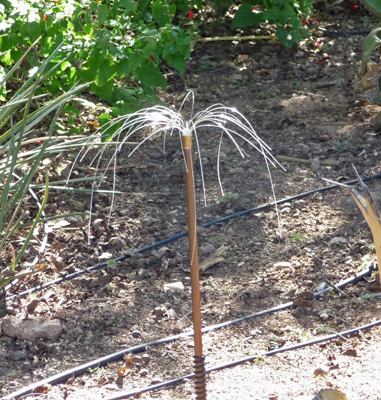 I don’t want to think about how many miles of cable and fiber optic filament Sonoran Light took to create! It got warm as the day wore on and we ended up sitting on a bench near some lovely red flowers that seem to have attracted butterflies. One of them stayed still long enough for me to catch a photo of it. It was a great day in the garden with Amy and Mike. 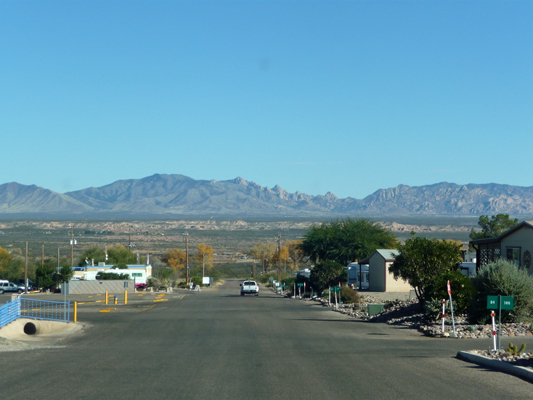 Monday morning November 23rd, we motored southeast to Benson, AZ and the SKP Saguaro Co-op, yet another Escapee co-op (like Jojoba Hills in Aguanga). They had a special going where first time visitors could stay for up to a week for $50 plus tax and electricity. We jumped on that since there was rain and colder weather heading into New Mexico later in the week and that’s the direction we’re headed. We’ll wait out the rain here and the move on—though there’s no rain in the forecast here. 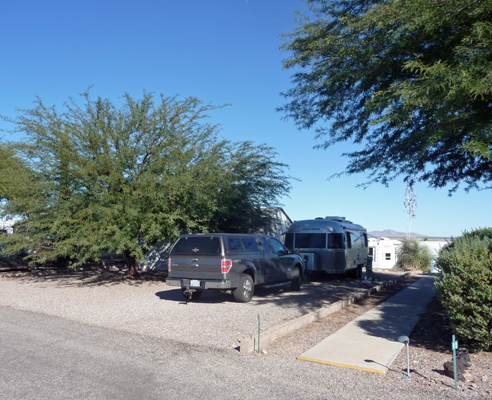 They gave us a lovely site with a huge mesquite tree in the front of the lot (and a small ‘casita’ in the back with a nice covered porch). 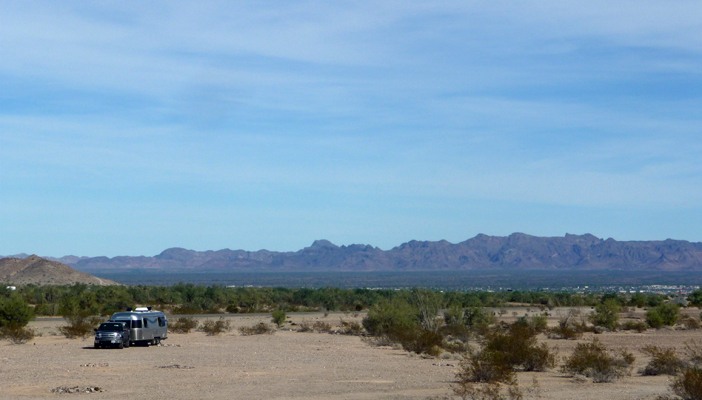 All with a view of the Dragoon Mountains off to the east. On Tuesday November 24th, after making a trip to town to get some papers notarized (the Washington Federal Bank folks did it for FREE), we took a driving tour of the park. It’s laid out on a gentle hill so each row of sites is a bit higher than the last (to maximize the views). Here’s the view down the main drive from near the top. Instead of the usual sheds that most of the SKP parks provide many people here have doubled and tripled the size of the sheds to have a small house next to their rig. Many have full bathrooms with bathtubs and washers and some even have rooftop decks. It certainly changes the feel of the place and makes it feel less transient. 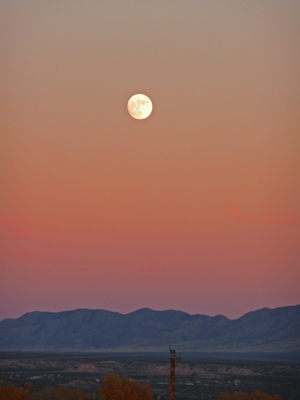 The almost full moon rose as the Dragoons began to light up near sunset. 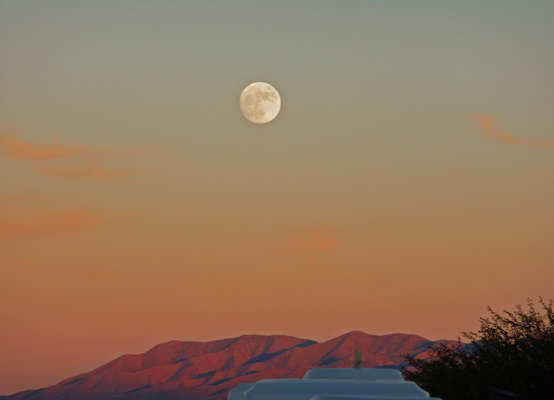 This was the view from our site. Looking a little further southeast the texture of the mountains changes. And the moon just got better and better. We took a bit of a stroll (down the hill to the Club House) and I took a photo of the view from the wide porch there. 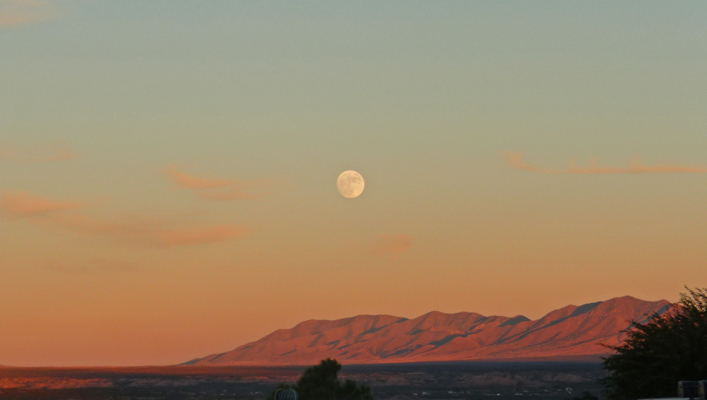 And then one last photo of the moon before it got too dim for good moon photos. Happy Thanksgiving to all. We have so very very much to be thankful for—including having all of you in our lives!